A full symphony orchestra consists of approximately 100 musicians playing string, woodwind, brass and percussion instruments led by a single conductor. Orchestra music is surprisingly prevalent and surrounds everyday life. One can relax to the Mozart symphony playing in a hotel lobby or march along to John Williams’ masterful score while watching the “Star Wars” films. But although many enjoy orchestral music in these specific instances, not many can say they enjoy or regularly attend orchestra concerts. In fact, of those who do attend, they commonly fall asleep or sit uncomfortably, trying not to make a single noise as the orchestra decrescendos to serenity. Quite frankly, it is difficult for most people to sit through hourlong symphonies, watching musicians dressed in black hypnotizingly move their arms back and forth. They pay more than $100 to enjoy the ingenious countermelodies of Brahms or the meticulous markings of Mahler but sometimes end up taking a very expensive nap instead. 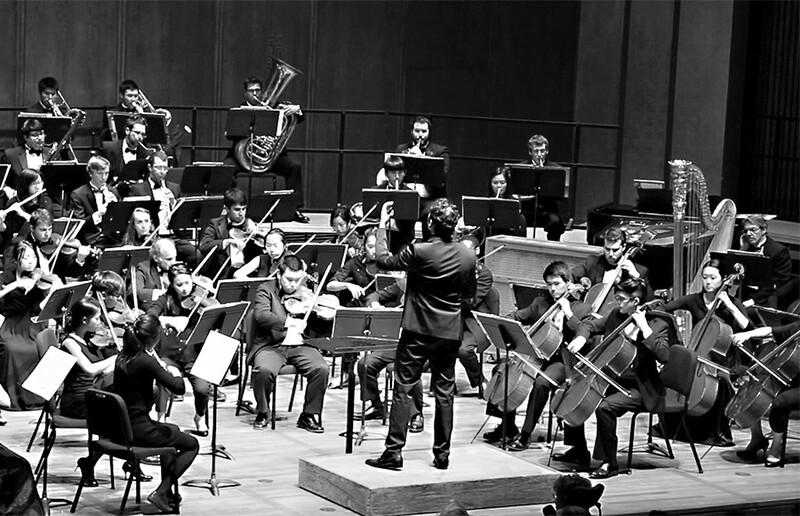 Professional orchestras receive revenue through concert tickets, recordings, and broadcasts. With high operating costs, though, orchestras cannot rely solely on these incomes to function and receive most of their funds through private donations and government funding. In the last several years, however, major orchestras in the United States have suffered greatly. In 2011, both the Honolulu Symphony and the Syracuse Symphony Orchestra ceased operations and world-renowned orchestras such as the Philadelphia Orchestra and the Louisville Orchestra filed for bankruptcy. Even though the Philadelphia Orchestra managed to come out of bankruptcy after a 15-month battle, they had to cut musicians and staff, as well as wages by about 15 percent. The Philadelphia Orchestra is considered among the top five symphony orchestras in the nation, known for its distinct sound and work with esteemed music director, Leopold Stokowski, and its premiering of a number of works by famous pianist and composer, Sergei Rachmaninoff. The financial crisis of such a historic and influential orchestra alarmed many in the performing arts industry and still continues to worry future artists today. In fact, of those who do attend, they commonly fall asleep or sit uncomfortably, trying not to make a single noise as the orchestra decrescendos to serenity. Quite frankly, it is difficult for most people to sit through hourlong symphonies, watching musicians dressed in black hypnotizingly move their arms back and forth. Many factors contribute to the decline of success in these organizations. On the whole, attendance and subscriptions have been falling through the years. US orchestra ticket sales have been decreasing by an average rate of 2.8 percent per year for more than a decade. With a decline in audience numbers and public interest, contributors are also less likely to donate. This past season, the Philadelphia Orchestra only filled about 76 percent of their capacity and created a deficit of $3 million in ticket sales and contributions. Not only is the population losing interest, but the government is also cutting back on funds for the arts. At the federal level, the National Endowment for the Arts is currently at $146 million, which is $30 million lower than its peak of $176 million in 1992. Even state governments has made large cuts over the years — Michigan spent $2 million on the arts in 2009 compared to $26 million in 2001. California is renowned for having the lowest per capita arts funding, and even though the budget is expected to improve and reach $11 million this year, that does not even cover half of the peak budget of $30 million in 2001. With the lack of funding and support, many members of the younger generation categorize classical music and orchestra concerts as traditional and pretentious — dull activities for the elderly. What many people do not know is that in response to the changing times, many orchestras are actually experimenting with new approaches. In May 2011, despite having gone on strike in 2010 over a wage dispute, Detroit Symphony Orchestra streamed performances online, receiving more than half a million views. This new spark of attention increased contributions from donors and raised attendance and subscriptions at concerts. Subscriptions rose by 25 percent in three years, and the Detroit Symphony Orchestra received 400,000 audience members for their classical series by the 2013-14 season. What many people do not know is that in response to the changing times, many orchestras are actually experimenting with new approaches. Because of the continuing financial crises of many orchestras, there are always discussions regarding the death of classical music. It is definitely possible and even expected that more orchestras will struggle in the upcoming years. No artist expects everyone to enjoy their art, but a little appreciation instead of indifference or ignorance can help bolster orchestras and the classical music community. Hundreds of years of classical works will not disappear. Whether it’s by collaborating with different forms of art and media or adhering to tradition, orchestral music will continue to evolve.